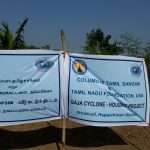 TNF’s Rehabilitation Projects will focus on two key areas with emphasis on long-lasting positive impact on Cyclone Gaja victims. 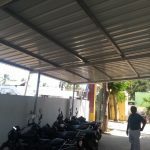 Our strategy is to make these projects cost effective by utilizing all the government and local resources available and then supplementing with our contribution to ensure quality and sustainability. 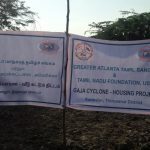 The Central and State Government have housing schemes to help Cyclone Gaja victims. The schemes require the beneficiary to pay a nominal amount (about Rs. 40,000). The most needy, living in devastated huts and working as agricultural laborers, are unable to pay this amount. They end up walking away from taking advantage of the government programs and are likely to continue living in their huts. Your generosity will help pay for that nominal amount and relocate such families from huts to concrete homes – a change that will impact those families for generations to come! 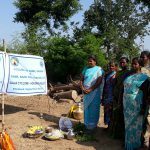 Bhoomi pooja was conducted on March 22, 2019 in Kunnaloor village, Thiruvarur District (supported by Greater Atlanta Tamil Sangam) and in Ettukuddi village in Nagapattinam District (supported by Columbus Tamil Sangam)to build concrete houses for those who lost their huts and could not afford to rebuild on their own. View floor plan of new houses to be built under this scheme. 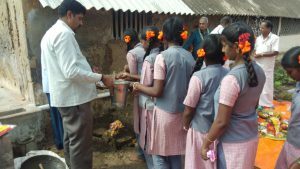 TNF has received requests from several government schools impacted by Cyclone Gaja. Some of these are TNF partners schools in the TNF-ABC education initiative. We will focus only on government and government-aided schools as that is where the underprivileged children go to school. Once the government announces which schools will get repaired, we will focus on the ones not getting any support from the government or other NGOs.